Egos aside, Edison and Foster really are just the same as any other deaf dog. They sleep through fireworks and thunderstorms. They know an impressive number of hand signs. They look at the wall when they don’t want to “hear” me “talk” to them. And they are velcro dogs through and through- always in sight and usually at my side. 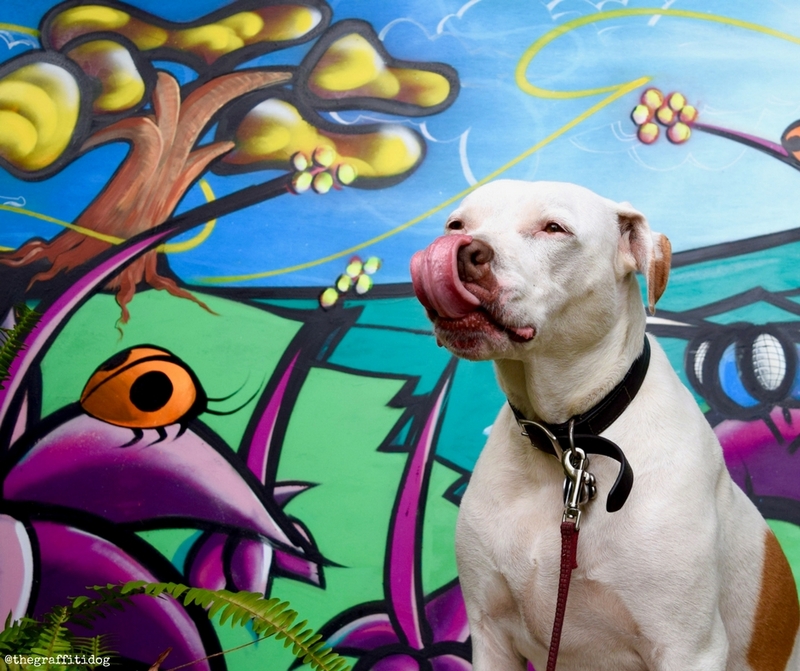 One other way Edison and Foster are just like many other deaf dogs is that they are non-pigmented white dogs with sensitive skin- a common experience of dogs with little to no skin pigmentation. To keep their skin healthy and happy- and Edison and Foster happy and comfortable by extension- I have to avoid topical chemicals, whether that is a topical flea/tick preventative or harsh, chemical-laden shampoos and skin care. If I apply any chemical to their skin, all hell breaks loose! It’s ugly, it’s uncomfortable and it’s frustrating- for them and me. I only use a shampoo with real organic herbs and other natural, human-grade ingredients with zero chemicals, such as Dr. Harvey’s Organic Herbal Shampoo with Real Essential Herbs. But the single most important way I help prevent our deaf dogs’ sensitive skin from getting irritated, angry and inflamed is by choosing the right dog food. And I choose Dr. Harvey’s Paradigm. Custom art by Daniel Osorno. What is Dr. Harvey’s Paradigm? Paradigm is a carefully and thoughtfully crafted “green food” pre-mix blend, which serves as an excellent foundation for a fresh-prepared, nutritionally complete low-carb or Ketogenic diet. 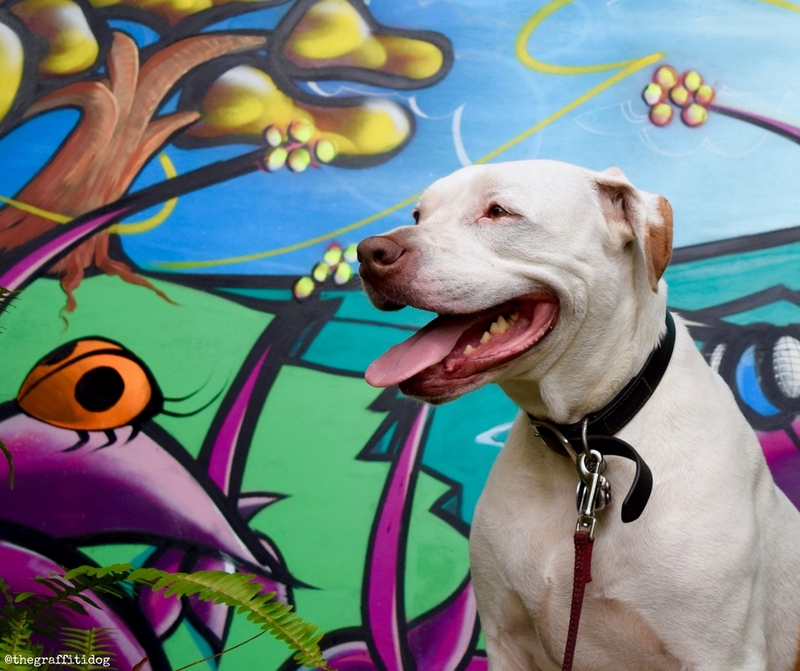 But what does that actually mean for you and your deaf dogs with sensitive skin? Holistic and integrative vets will tell you that a low-carb, low-glycemic diet can help prevent, manage and overcome serious medical issues such as skin conditions, immune system weakness, obesity, diabetes and, yes even that dreaded C word: cancer. Paradigm was developed by Dr. Harvey’s based on studies and research by holistic vets and medical researchers. It’s grain-free and contains a holistic blend of 6 dehydrated, low-glycemic, low-carb vegetables that are digested slowly by your dog’s body, preventing a spike in blood glucose levels. 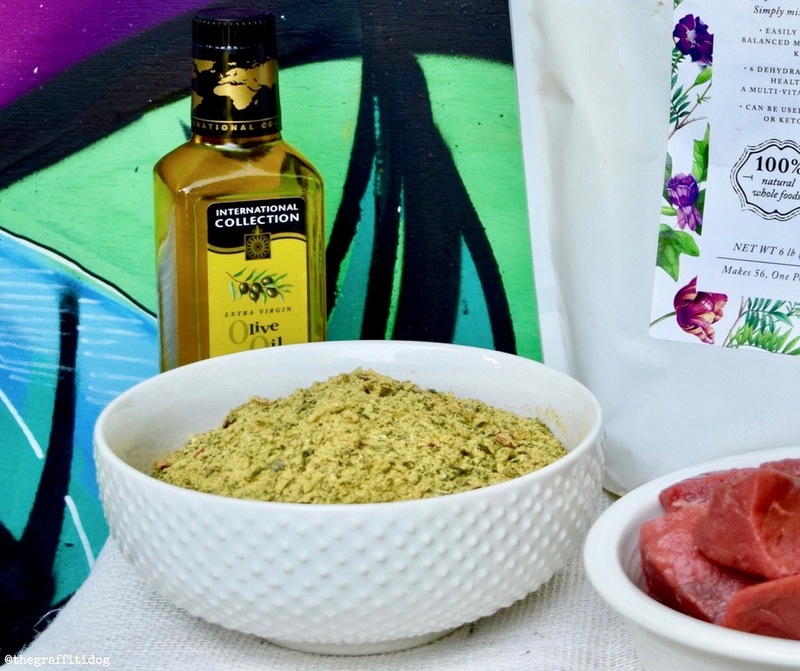 It also contains a healing blend of herbs that were specifically chosen for their powerful ability to treat or prevent inflammation, improve health and act as a natural blood purifiers. 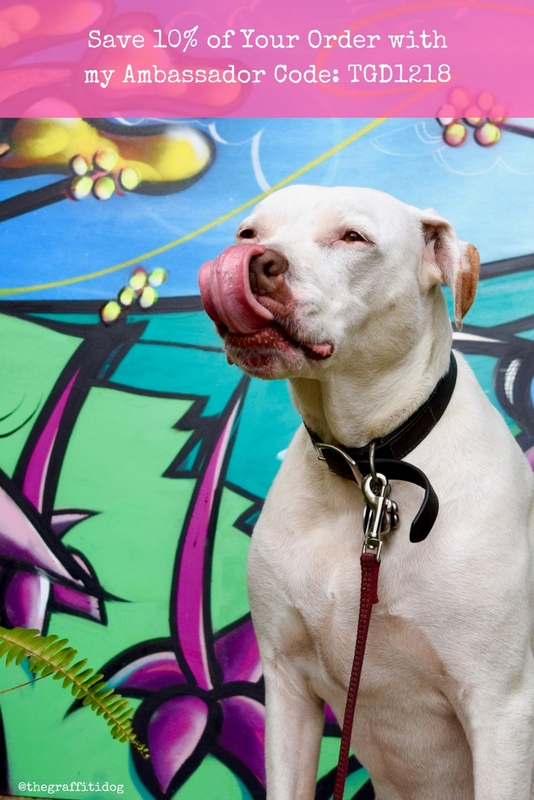 Bone broth, turmeric, cinnamon and ginger are all especially important anti-inflammatory herbs that are perfect for deaf dogs with sensitive skin or who suffer from chronic skin issues- or any dog for that matter. In short, every ingredient in Paradigm was chosen for their anti-inflammatory properties as well as their low carb, low glycemic properties. Oh, and Paradigm has absolutely no dyes, fillers, preservatives, corn, wheat or soy. I Don’t Cook For Husband But I Cook For My Dogs…In 10 Easy Minutes! Preparing a fresh meal for your dog has never been easier. Paradigm makes it easy to prepare fresh meals right in your own kitchen with no hair-pulling, facepalming or complicated recipes to follow. Simply add hot water (or broth) to Paradigm, add your choice of protein and healthy oil – and that’s it! In just a few minutes, you’ve prepared a fresh, low-carb, holistic meal that can help prevent, manage and overcome some serious medical issues, sensitive skin included. You should rotate your protein sources regularly to ensure that your dogs are receiving a complete amino acid profile. Dr. Harvey’s recommends rotating protein sources every week, but since I’ve always rotated my dog’s food very frequently, I’m switching up proteins every day. I’m also rotating healthy oils about once a week: fish oil, coconut oil, hemp oil, krill oil and more. For even easier preparation, you can use Dr. Harvey’s Health & Shine salmon oil capsules instead of oil. These are especially beneficial to deaf dogs with sensitive skin and I’ve been using them for almost three years now. In addition to helping keep my deaf dog’s sensitive skin and coat healthy, happy and shiny, I love that Paradigm is an easy way for me to offer my deaf dogs a fresh-prepared meal that meets all of my dog’s nutritional needs and also allows me to be in complete control of the proteins they are eating. But I’m A Raw Feeder? So you’re a raw feeder and wondering if Paradigm aligns with your approach to dog nutrition? Yes, absolutely yes! When feeding raw, making sure your dog’s meals are nutritionally balanced is critical. In fact, an unbalanced raw food diet is one of the biggest mistakes an enthusiastic raw food newbie makes. 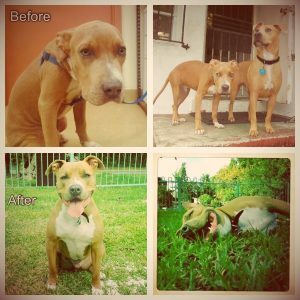 Paradigm takes the measuring, math and guesswork out of feeding a balanced raw food diet. 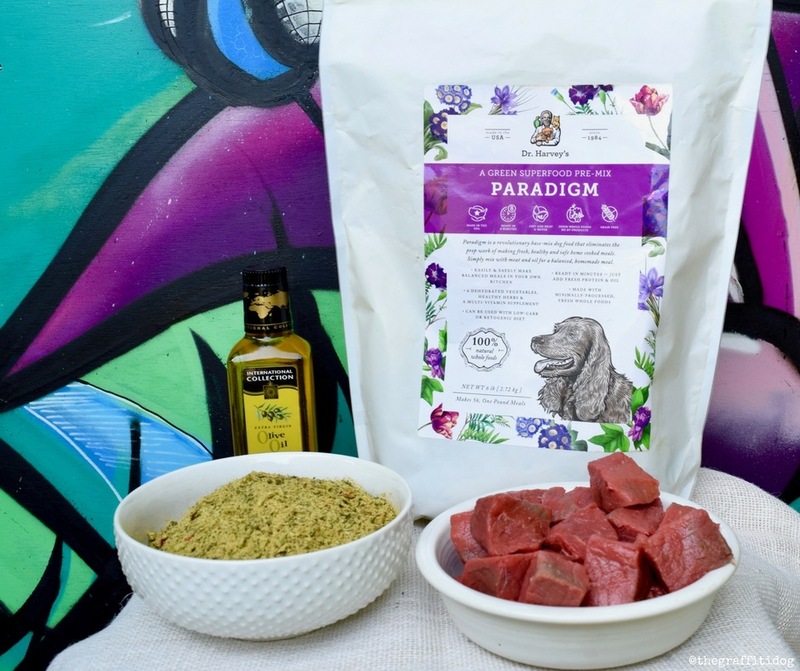 To incorporate Paradigm into your dog’s raw food diet, simply add water to Paradigm, toss in your raw protein and top it off with the healthy oil of your choice and you have a balanced, nutritionally complete raw food diet and you didn’t curse once! Not Everything Healthy Has To Taste Yucky! Since I’ve started feeding Paradigm, I’ve never seen them eat so fast. They love it so much that once their own bowl is empty, they begin to play musical food bowls, taking turns licking each other’s already picked-clean food bowl. Since we’ve started feeding Paradigm, the boys no longer wait patiently on the couch for their food. Now, when I’m preparing their meals, I have an audience of four dogs in the kitchen, waiting impatiently, watching my every move, wishing I would hurry up already. I’m pretty sure I can hear the drool dripping from their mouths to the floor. 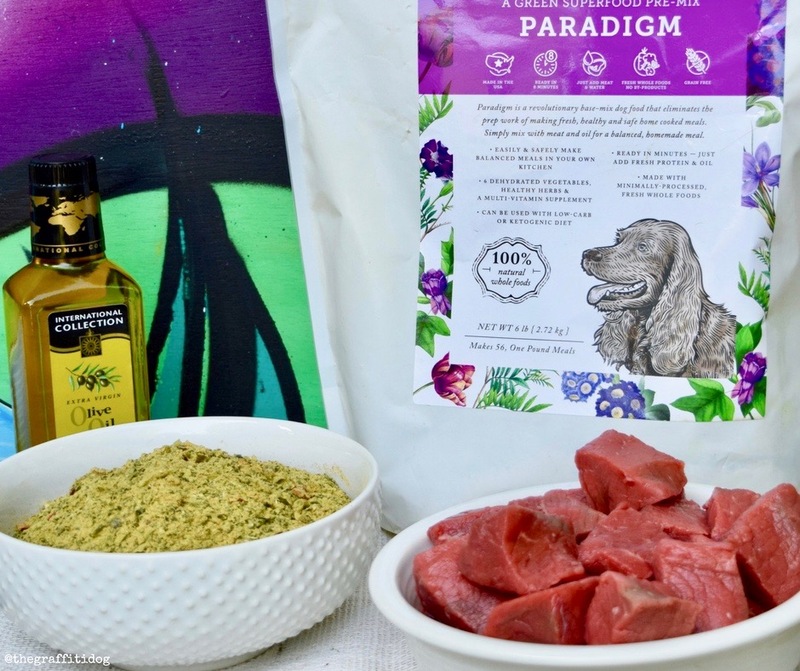 As a deaf dog pet parent, and as a veterinary technician with a keen interest in holistic, natural diets and the healing power of herbs, I am thrilled that, thanks to Dr. Harvey’s Paradigm, I can offer my beloved boys a fresh-prepared, low-carb, holistic food with proven health benefits that they love! And THAT is why I choose Paradigm by Dr. Harvey’s! Ready to try Dr. Harvey’s Paradigm for yourself? Use discount code TGD1218 to get 10% off! I’m glad you’ve found a great food that keeps your dogs skin healthy and also offers the right nutrition. dr. harvey’s does a great job with their healing cream as well. Great post, bone appetit! I enjoyed your article so much and definitely learned a lot from it. there’s always the challenge in finding the right dog food, and i’m so glad you found a good one for your cuties. this is not a brand i’m familiar with so thanks for sharing. i like the ingredients in the shampoo, and since jack tends to have sensitive skin it sounds like a great option for him. It’s so great when you find a food that your dog loves. Eagerness is a good sign!Mr. N is picky so it took us a while but he eagerly awaits meal times. so great to read about a healthy addition to a raw diet, I too add a powder to our dogs’ raw mince and once or twice a week, I add sardines or mackerel. since we have been feeding this food, i too have an audience and no fussy eaters, they can’t get enough of their food and they are healthy dogs! I love to read about healthy, natural & holisitic products for dogs. I don’t have a dog however never knew about sensitive skin in white dogs. I learned something new. 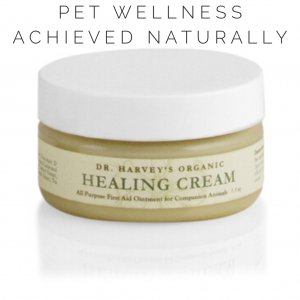 It’s great that Dr. Harvey’s paradigm products work well for your dogs both inside and out! It’s nice to see products that keep quality ingredients and pet’s health in mind. It sounds like a great choice for all dogs, but especially ones with sensitive skin. My Maltese has a lot of allergies, but I never considered it might have something to do with her lack of pigment. Her diet makes a big difference to her. We don’t get Harveys where I live. But I do believe that food has a lot to do with overall health, including skin issues. None of our guys actually have ever had any serious skin issues, except Jasmine who was prone to infections due to her thyroid. Dog’s diets certainly are changing as we become more aware of what is truly “healthy” for them. Glad Dr. Harvey’s is making your dogs happy and healthier. So happy you find a the right food to help his sensitive skin. I’ve heard so many great things about Dr. Harvey, i really need to tell my humans to check this out!!! btw I love your photos, amazing!!! Happy to hear you’ve found a food that works for your dogs. I never thought about light colored dogs having skins problems, too, but it makes sense. We’re back to the vet with Truffle to talk about her new diet plan, so I’ll be doing a lot of research.